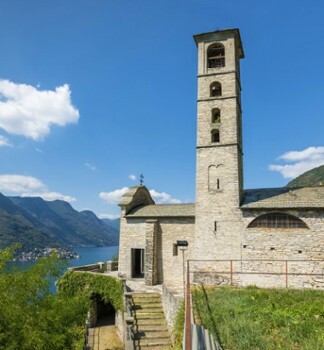 The church of San Rocco was the parish church of Pognana Lario up to 1744, when a new parish church dedicated to the Holy Trinity it was consecrated. It was then "downgraded", lost its dedication to the Holy Trinity, and was re-dedicated to St. Rocco. Exact origins of this church are known but it is thought to originate in the fourteenth century. 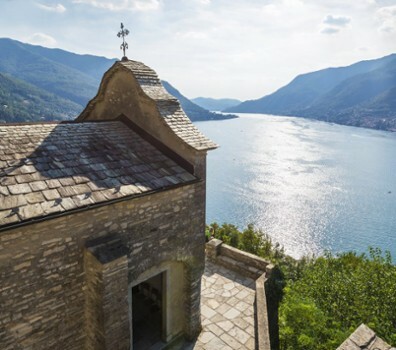 The church has most likely reached its current appearance through changes and expansions that followed over the centuries and that had their peak during the Baroque period. 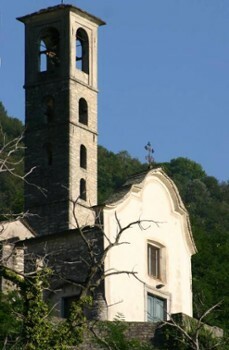 The church has a facade built in Baroque style during the eighteenth century: it is the only outside plastered, the rest is in exposed stone; along the right side stands the belfry. Upon entering you will see two banners devotional exposed on the counter. Continuing along the right wall, are fragments of frescoes greatly damaged. 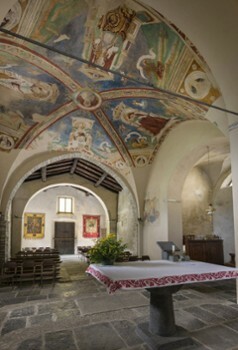 The most interesting area of the transept, however, remains the central vault, frescoed: the paintings were made at the beginning of the sixteenth century by Bartolomeo De Benzi (painter native of Torno and also active in the church of Santa Maria di Vico in Nessus). Sails once home to the Doctors of the Church with the symbols of the Evangelists (Ambrose with the lion, symbol of Mark; Jerome with the bull, symbol of Luke; Gregory with the eagle, symbol of John Augustine with angel- not more visible- symbol of Matthew), the corbels some busts of Prophets and, finally, the keystone of God the Father blessing. 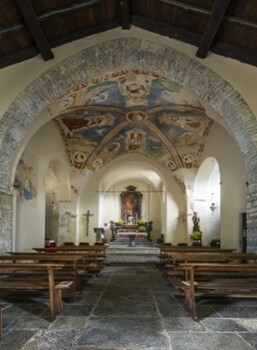 The restoration work, carried out between 1965 and 1987, they tried to revive the building's original appearance, eliminating the Baroque additions, and have brought to light the frescoes remember who remained hidden for many years under the plaster. 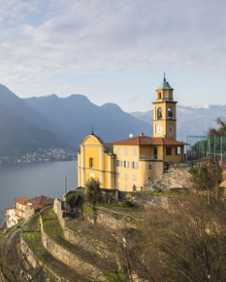 Nearby Things to Do include: Monuments such as Giant Wine Press (Il Torchio) and Joseph Frank Pyramid Mausoleum; Water Activities such as Lido di Faggeto and Careno Beach; Hikes & Walks such as Buco dell'Orso and Porta Travaina; Villas such as Villa Oleandra and Villa Pliniana; Towns such as Faggeto Lario and Laglio; Churches such as Santissima Trinità and San Miro.